Food, Cycling & Sweat | My journey to eat and live a healthy life! Strawberries make the world go round! Had breakfast this morning and oh how I have missed my strawberries! I was out of them for over a week and have since realized that they must have a super power that keeps the Earth spinning! They can top just about any kind of breakfast! Here’s what I enjoyed this morning! 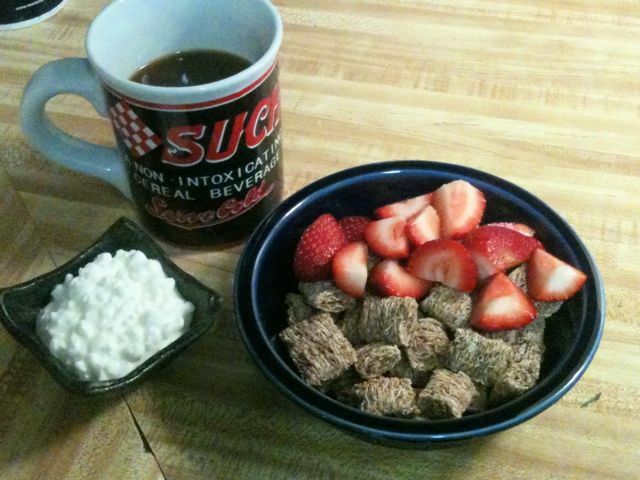 Kashi Autumn Wheat cereal, cottage cheese, local KBC coffee and of course… STRAWBERRIES! But what is so good about them aside from their excellent flavor? It’s fruit, DUH! OK, to be serious now… strawberries are high in fiber, vitamin c (don’t like oranges? pick up some strawberries!) and other vitamins, and are also full of antioxidents and phytonutrients that fight free radicals in our bodies. All that power in a tangy-sweet little bite size morsel! Who would have thought that Clean Eating could be so delicious! Other berries (blue- rasp- black-berries, etc…) are equally good for you as well, so take advantage of berry season, stock up on frozen berries for the winter and enjoy! Not sure what to do with berries? Put ’em on cereal, oatmeal, or drop ’em in yogurt or cottage cheese. Make a salad with them or a healthy berry cobbler dessert. Or, just eat em straight from the package! 1. VINAIGRETTE In the small bowl, whisk together the champagne vinegar, olive oil, honey, and sea salt. 2. 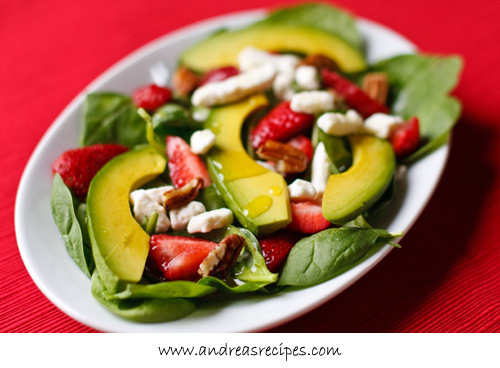 SALAD: In the salad bowl(s), arrange the ingredients in layers: baby spinach on the bottom, then strawberries, avocado slices, pecans, goat cheese, and pecans. Serve with the vinaigrette. *recipe and image courtesy of Andreasrecipes.com. Hope everyone enjoyed my double post Monday! Question: What is your favorite way to eat berries? This weeks weigh in, 211.5 lbs. Proof that even when you slide backwards a little, mess up from time to time, you can still be rewarded! This helps to strengthen my resolve and really reminds me what I am struggling for. 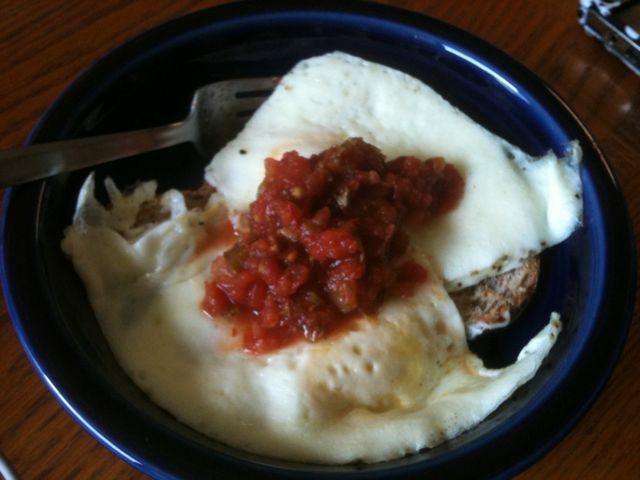 Two eggs over easy, one slice of Silver Hills Mack’s Flax sprouted grain bread and a spoonful of organic salsa. Delicious breakfast. 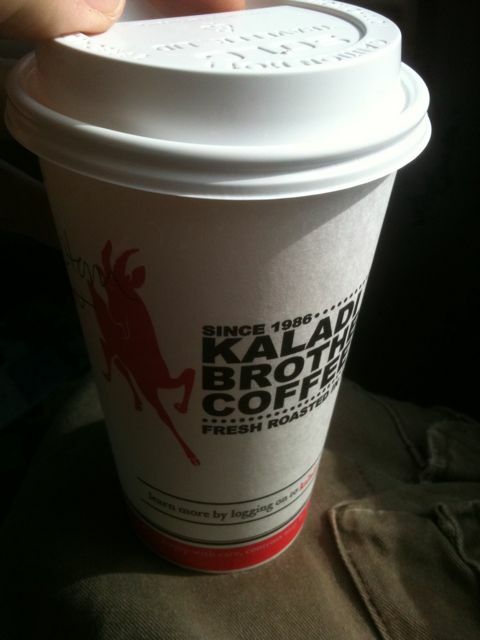 And of course there was local KBC coffee to wash it down! For a quick lunch we split an order of sushi. 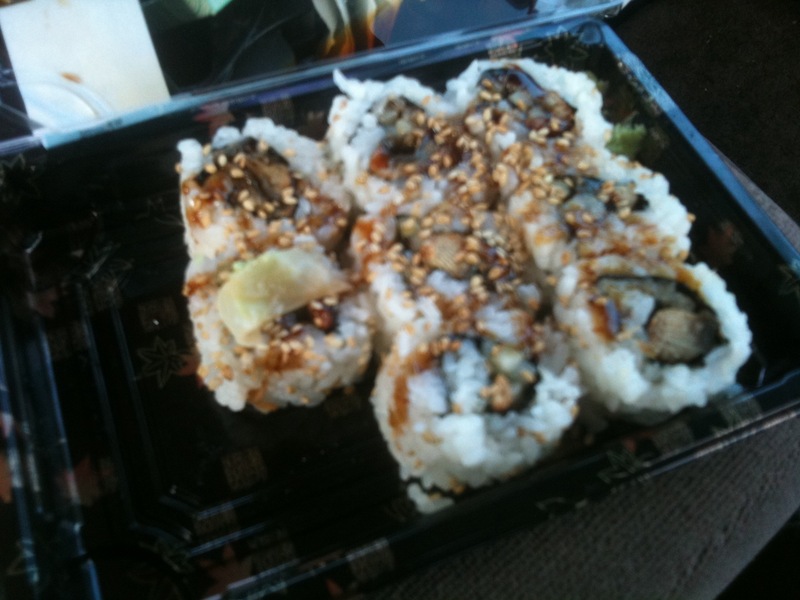 My wife and I LOVE sushi and this lunch hit the spot. 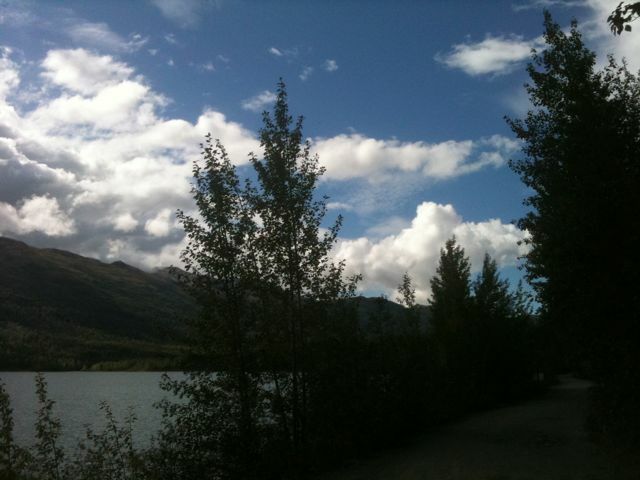 So after lunch we headed to Eklutna Lake for the afternoon and enjoyed (a little) sun and (a little) rain. 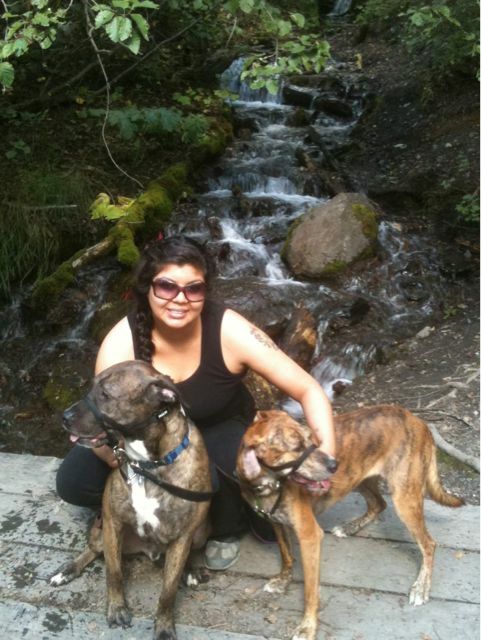 Walked for a good hour and a half enjoying mountain views and a gorgeous lake shore. 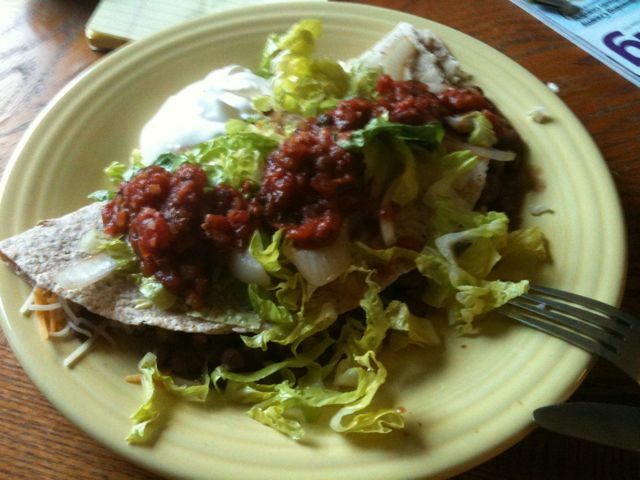 And as for dinner my wife and I split half of a half chicken quesadilla (1/4) and topped it with fresh made guacamole, salsa and lettuce and a spoonful of sour cream. So, that was my day in a nutshell. Very good day. Hope everyone else is doing good too! 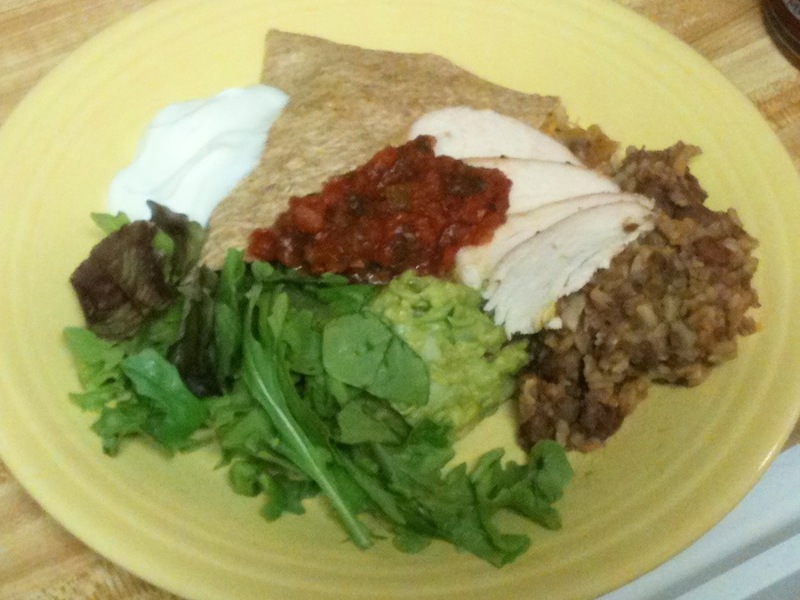 The beans were slow cooked in chicken broth and tasted great. Maybe a little bit on the carb heavy side for dinner but hey, gotta splurge every once in awhile right? Dessert was a small cup of plain vanilla ice cream with some chopped dark chocolate sprinkled on top. Hopefully we have many more ahead! Good night! Anyways, back to the oats. My attempt was an apple cinnamon (for lack of other ingredients, i.e. strawberries – *cry*) and my first impression was simply ICK! But, try try again is the old motto, so I did. I promptly decided to warm them up over the stove and that seemed to do the trick for me. They were decent, but I think I have something against cinnamon. Either way, when my fridge is refilled with good toppings, I will definitely give this breakfast a second go. -combine ingredients to sucanat, mix, and refrigerate over night. -chop apple into bite size chunks, combine ingredients in pan, add cinnamon and stir over med/low heat until desired temperature. Serve and enjoy. The whole reason behind the attempted breakfast is the simplicity of it. Add berries, vanilla, PB, you name it! The possibilities are endless! And for somebody that works at 6:30 am (my loving wife who too often skips breakfast), simplicity is a must in the morning! Well, I’m off for now to read more blogs before work. 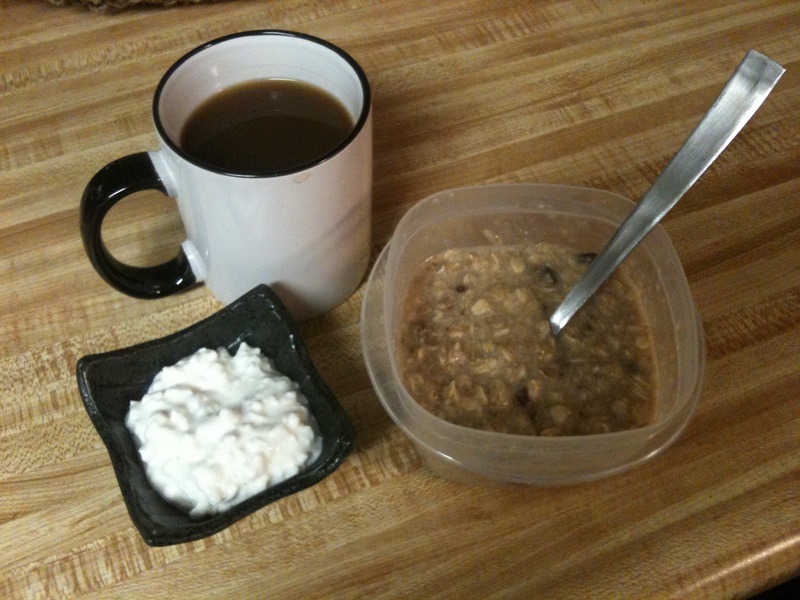 Question: What is your favorite oats flavor/topping combination? First, people are good at making excuses. No, really! We are! We will find or fabricate an excuse to get us out of any situation we aren’t comfortable with or simply don’t want to deal with. “Well, I didn’t eat a lot today so I will just exercise tomorrow,” or “It’s raining out so I’ll do my run when the weather is better.” These are all to common. So if you find yourself making excuses frequently, try writing them down. Look at them and then see if you can actually justify it. If you write down that you got hit by a car and are laying in a hospital bed then you’ve probably justified it. If you put down that you had a big dinner and are tired then you’re just making excuses! Second, it is good for people to plan ahead. That is, don’t just show up at the gym not knowing what you intend to do. Many a failure has come this way. I have failed this way! I showed up, didn’t know what I wanted, got on a treadmill for 2 miles and left unsatisfied. Planning out your routine, what days you intend to exercise and so forth can definitely improve your chances of exercise success. Lastly, write out a list of goals. What is it you really want, what is your prime goal and what are your smaller goals. Reward yourself when you achieve those goals (i.e. go on a small shopping spree, allow yourself a sweet dessert that is out of your normal diet, etc…). The goal system is a boost in motivation and confidence for anyone trying to change themselves. The reward system is also a good way to push yourself. This concept helped me quit smoking and I am trying to make it work for my exercise routines as well. Always remember that little things can add up to big results. 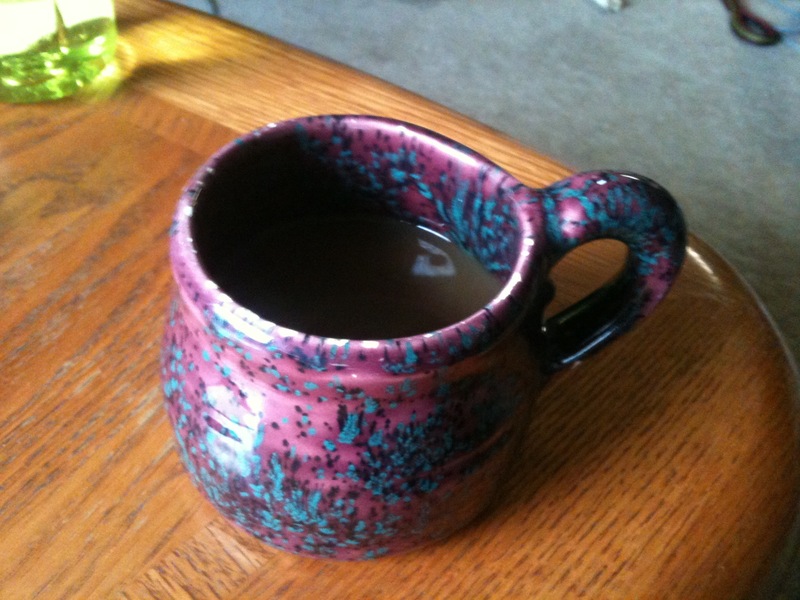 Replace the sugary coffee in the morning with a simple “skinny” latte or a plain coffee. Ease up on sugary foods, eat more fruits/veggies, etc… Every change you make for the better is one small step closer to your ultimate goal. So, that is all I have for today’s post. Sorry but I have no food to show unless Moose’s Tooth Pizza is consumed later. We’ll see! 🙂 Goodbye for now and good luck for tomorrow! So just a quick update for anyone following my journey… Current weight is 212.6 lbs and my mood is optimistic. 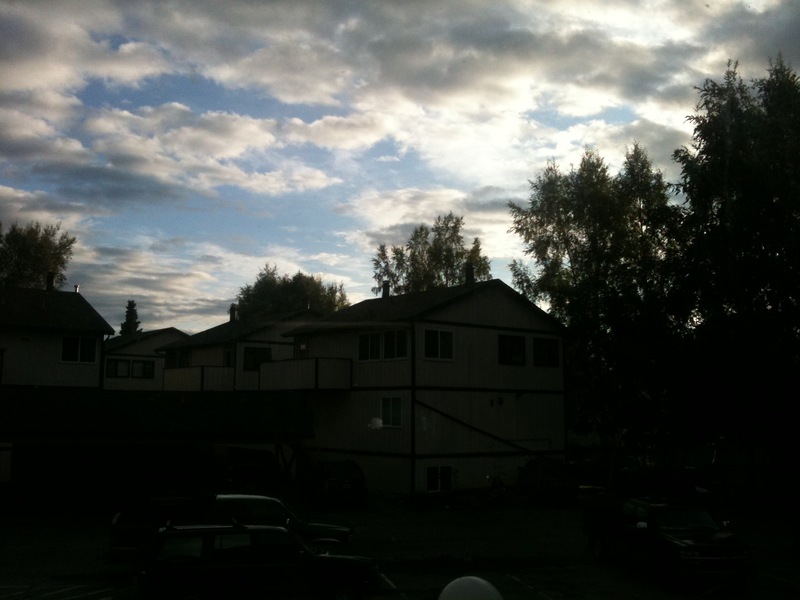 Today’s food was great and I’m thinking Friday night Moose’s Tooth pizza, the BEST in Anchorage! 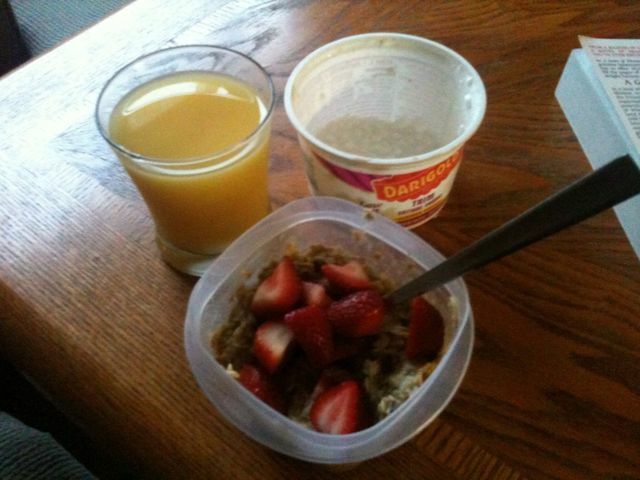 So, breakfast was usual oats and berries, cottage cheese and OJ today instead of coffee. 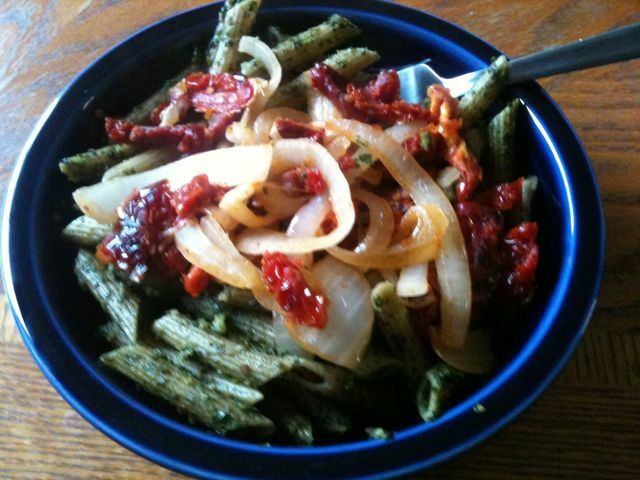 Lunch was last nights dinner: Pesto pasta minus the onion and tomato. 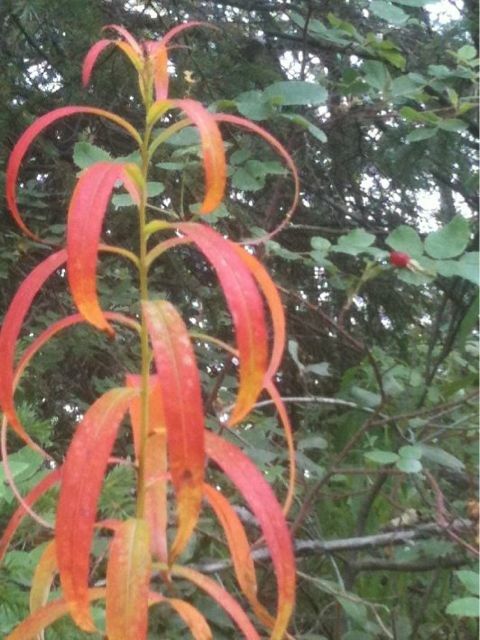 Had some blue corn chips and salsa for a snack as well. I’m also keeping up with my water intake as this is a major player in weight loss. In fact, maintaining adequate hydration and eating a proper breakfast are quite possibly the MOST important players in losing weight. It works for me, but is also the two hardest things to remember to do when years of my life went by with those items skipped. So anyways… Hope everyone has a great night and hopefully I start posting more again soon! 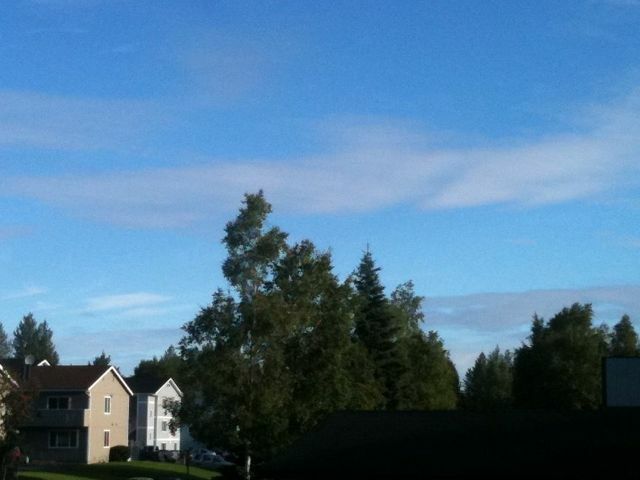 Well today, for a change, the sun is actually shining. Barely. Which leads to my question: What are some of the most creative dishes you’ve made when ingredients started running out?